In this series on unusual careers, we introduce you to people who've quit the 9-to-5 grind to find their passion and pursue interesting careers. Today, we speak to Gayatri Gandhi, a tidying consultant who helps people organise cluttered spaces at work and home. If you are on Netflix, there is a very slim chance you haven't heard of Marie Kondo. The Japanese organising consultant (of Tidying Up With Marie Kondo series on Netflix) is the brain behind the internationally acclaimed KonMari method. The KonMari method involves categorising one's belongings, keeping only those objects that 'spark joy' and letting go of the unnecessary things that clutter to your life. The simple concept of packing and tidying up cluttered spaces has been winning hearts internationally, both online and offline. Kondo, the bestselling author of four books, was listed among the 100 most influential people in 2015 by Time magazine. She is an inspiring example of how to turn your passion into a profession and earn money in the process. 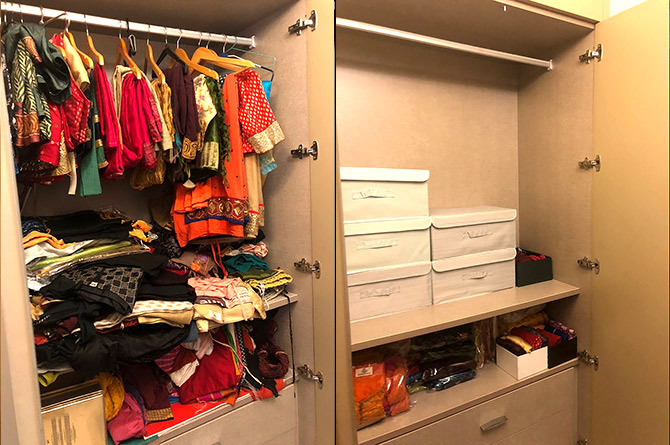 Gurugram-based Gayatri Gandhi, 36, is India's first KonMari certified consultant. As part of her job, she helps people organise messy, cluttered spaces and bring their stressed lives, relationships and careers back in order. 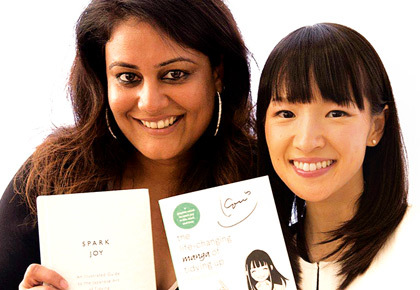 After training for a year with the KonMari team, Gandhi launched Joy Factory in August 2017 in Gurugram. As of date, she has worked with over 20 families in Delhi and Mumbai. Gandhi tells us how, four years ago, she realised the career potential in being a tidying consultant. Today, that realisation is helping her succeed on the professional front. IMAGE: A client's wardrobe, before and after her consultation. I have a masters degree in mass communication from School of Convergence, International Management Institute, Delhi, and was working with the Discovery Channel for nearly 10 years. I then took a sabbatical because I wanted to do something on my own. I discovered who Marie Kondo was when I picked up her book, The Life-Changing Magic Of Tidying Up, in 2015. I was instantly hooked. I have always been meticulous and methodological. I like to organise and sort things and people admired that ability at my workplace. I was curious when I realised that someone (Marie Kondo) had actually turned this into an (career) opportunity. Back then, I had a business partner. Together, we'd surveyed over 200 people across India to know if they were willing to let someone inside their personal space if they offered to help organise it in a certain way. Over 75-80 per cent of the respondents were positive about the concept. It made me realise I was on the right path. Three years ago, Marie Kondo wasn't as popular as she currently is. Today, she is an international phenomenon. When I told my parents and friends, they were sceptical about whether the concept would work in India. But I had faith in the idea. I could see the future. 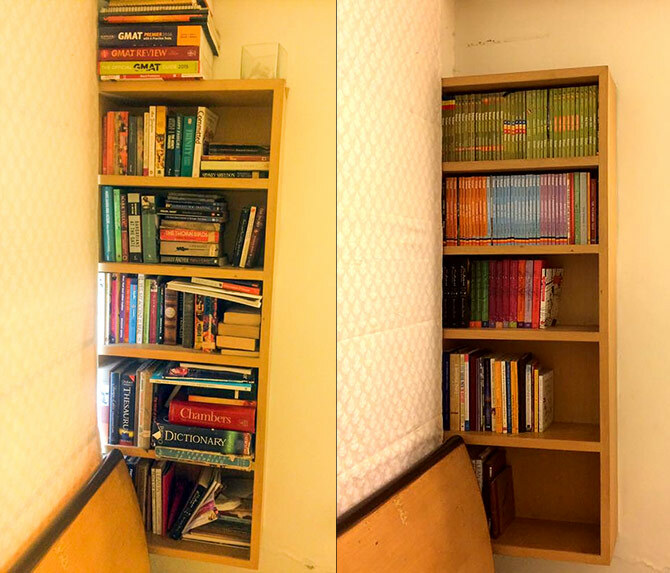 IMAGE: A bookshelf, before and after applying the KonMari method. It wasn't easy to become a part of Team Marie Kondo. I had to follow a seven-step process, which is mentioned on the website. The first is to sign up and read all of Marie's books, to fully understand the concept and process. Then, you have to try and apply it in your own home. You have to send before-and-after pictures to the team, who will review your work as proof of how well you have understood the concept. If you are selected, the next step is to enrol for a three-day seminar which is held either in the US/UK (overall cost, approximately $2,500). Then, you work with clients and send samples of your work for the team to approve. After this, you write an online examination and, if you clear it, you receive a certificate of affiliation. The process can take you anything between a year or more, depending on how passionate and skilled you are. IMAGE: A messy bathroom gets a renewed look. After I decluttered our space, I saw how much difference it made to our lives. A few projects that my husband was stuck with suddenly started moving in the right direction. That is when I realised clutter has a direct relationship with our life. KonMari's basic idea is that clutter is negative energy. Most of the time, we don't clean up or organise because of sheer laziness. It slowly adds up and becomes a part of us, which also leads to negative energy and cluttered thoughts and ideas. Decluttering your personal space can de-stress you, unclog your mind and actually change the way you think. The impact a tidy and organised workspace or home can have in your life is rewarding. It was humbling to meet and know Marie Kondo through her work and during the workshop. She has slowly built a reputation from something that is so crucial to our existence but no one had thought of catering to professionally. She never says she is perfect and is always willing to listen to you. She has an infectious smile and energy about her that is inspiring. The love she shares for non-living things will make you look at life from a different perspective. When you sign up for a project, you sit and pray with the family. You develop a bond, trying to understand what the home, the space and its objects mean to them. There is a lot of dignity involved in helping people unclog their messy space. Not everyone is capable of doing it. It requires experience to be able to patiently listen to your client, understand their problems and work with them through their issues and find a solution. IMAGE: The KonMari method involves organising your belongings into categories for easier identification and use. When I started off, people used to mistake me as someone who does "ghar ki safaai or offers cleaning services". When I would tell them that I am a consultant who will only guide them on how to organise their home and that they have to do it themselves, most people would ask, "Toh phir aap kya karenge (what will you do)?" Initially, it was a challenge trying to explain the concept to people in India because the idea was new. There were already some players providing cleaning services, so it was natural for people to misunderstand. Thankfully, after the series (Tidying Up With Marie Kondo) came on Netflix, I didn't have to introduce my work. Being the first KonMari consultant has definitely given me the edge as a professional and entrepreneur. My first project was for a couple in Mumbai who had just delivered a baby. They were struggling to keep their place in order. Unlike Delhi houses, Mumbai homes are smaller, which made the job even more challenging. While the session was set for 16 hours, it ended up taking much longer (22-24 hours spread over two months), for which I had to travel from and back to Delhi. I realised that even if people understood the concept, decision-making takes time. It's not easy to give up things that have been a part of your life. 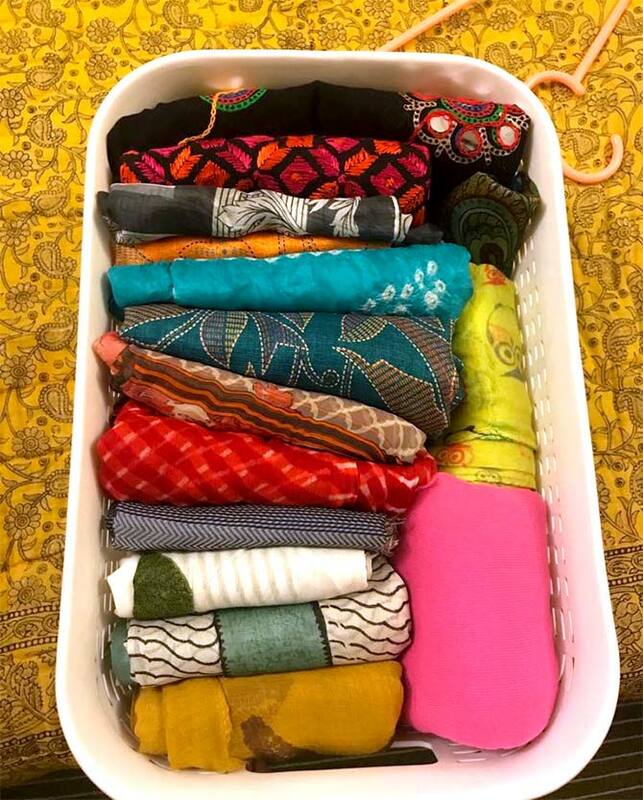 In India, we have a lot of hand-me-downs, gifts and things passed on, acquired or accumulated that we knowingly or unknowingly get attached to. We don't realise the space it takes or consider giving it away. Instead, it piles up and lies there, cluttering your space. My first project taught me a lot about the importance of patience, empathy and staying focused. The person using my services had trouble packing her stuff but, after the consultation, she sent a picture of a suitcase which was half full. She had finally been able to decide what to keep and what to let go. It was challenging but worth the effort because it was my first successful assignment. Next, I worked with a severe Obsessive Compulsive Disorder patient, who had spent time in rehab because of her condition. The fact that she had a medical problem made it challenging for me to understand the humane aspect of the job I was involved with. I had to stretch my work hours. I worked about 5-10 hours a day with her, without getting angry, upset or being judgmental. My sessions were longer than usual. I had to be flexible and different in my approach. Today, when her mother calls and says how much it has helped, it reveals the warmth you shared with the person and it sparks joy within me. I feel proud that I was able to make a positive difference in someone's life. I have worked with 20 families in the last two years. Most of them have been from Delhi and Mumbai. I also do workshops and have received requests from people in Kolkata, Indore, Chandigarh and Kanpur to do workshops, which I am considering at the moment. IMAGE: Clothes are arranged after applying KonMari's three-fold method. According to the concept, clothes are folded in threes (not halves) and stacked next to each other (not above). The parameters are not rigid. What works for one person may not work for another. Someone may want to keep 20 pairs of shoes or jeans. You can't tell them not to. Your job is to help them find a way to organise it. Also, each home and client is different. Sometimes people get so engrossed in sharing their stories and problems that you really want to shake them up and tell them to stop. But that's not how it works. In this profession, you have to really patient and flexible. You also have to be trustworthy because you are working in someone's private space -- their bedroom, living room, etc. You have to be able to respect that and work as a team even if you don't agree with them. Each day throws up a new challenge, a new learning and experience. You have to go with an open mind. The idea is to share your knowledge with the people you work with. You have to give your 100 per cent in each task all the time. 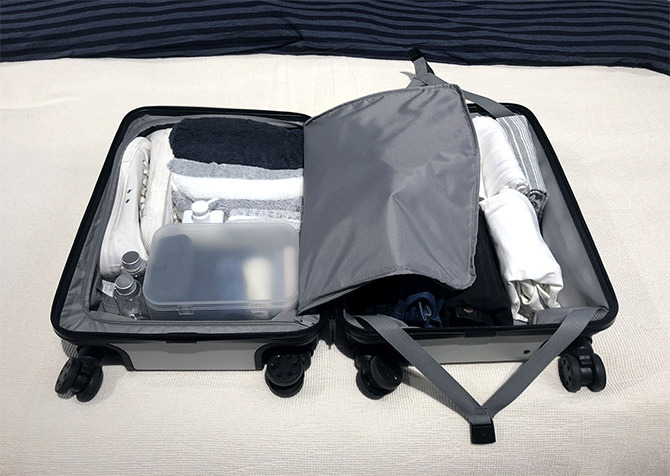 IMAGE: A photograph of an organised suitcase sent by a client who learned the art of packing for travel. Each consultation takes approximately 20 days. A single session lasts between 3-5 hours. I take about six sessions per client. I charge Rs 2,500 per hour for a session in Delhi and Rs 3,000 for outstation visits. Since I am independent, I can safely say that I am doing well financially and I am happy. Today, those who were sceptical about my decision look at me and say, "Wow, you did it. We are proud of you." There are people who call up and ask me how they can become a consultant. It's inspiring what success can do, how it multiples itself. If you have a natural flair for organising and tidying things, you should give it a try. Remember, you will work with different sets of people. You need to be prepared to deal with people of different temperaments. You have to be extremely patient and flexible to work according to what suits the client, while following the procedure at the same time. You show them how to do it, but eventually they have to do it themselves. It's not always easy. You have to follow up from time to time. If you are working with clients from different cities, you may have to travel a lot. It's a slow, novel but immensely rewarding experience. If you enjoy solving problems and working as a team, you will love this profession. No matter what anyone says, if you think you have the skill and the will to do it, don't ever step back. Go for it; you won't regret your decision.